Head to the Bathtub: King Bidgood's in the Bathtub Giveaway! 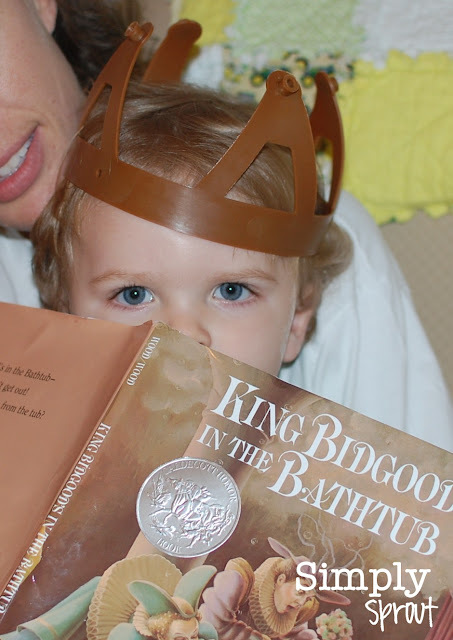 This week's Lil Sprouts Book Club choice takes us to the bathtub for a silly tale of a king who just won't get out. King Bidgood's in the Bathtub by Audrey Wood is a humorous tale of a stubborn king who has no desire to get out of the tub. I probably wouldn't either if I could eat, fish, dance, and play in the tub like the King. His faithful page tries hard to get him out, but it finally takes pulling the plug! The illustrator Don Wood, Audrey Wood's husband, earned a Caldecott Medal for his delightfully charming depiction of this oh so ridiculous king and his medley of guests. This is a family favorite book of ours especially when our son is fresh out of the bathtub! So in the honor of Bidgood we headed to the bathtub. We have some major cabin fever going on (Debby is still in our area) and we're on a messy painting theme in our house. Sounds like a dangerous combination right? Stuck in the house and wanting to be messy and paint each day, yikes! 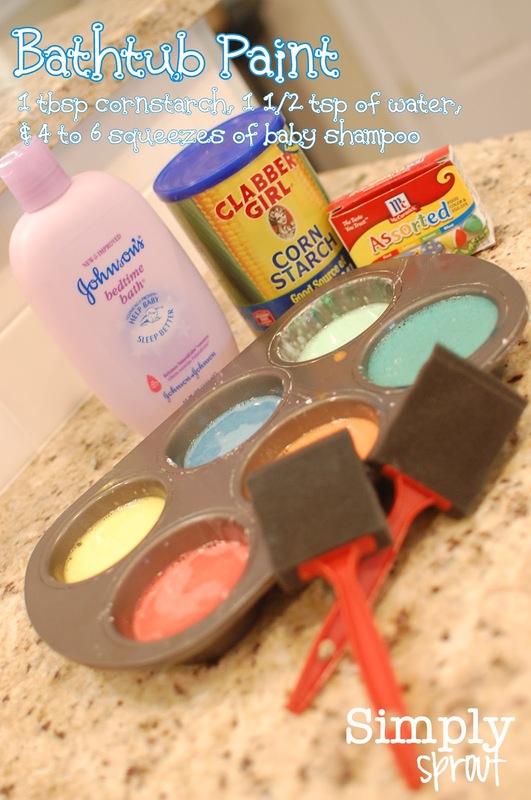 It was a perfect day to try out a homemade paint recipe that Marcy shared with me using baby shampoo as the base. I have seen others that called for shaving cream, but thought that it would get in eyes and there would be crying. It worked out fabulously and we had a royal time painting every inch of the bathtub. What a colorful way to enjoy children's literature. We used the paintbrush to make rainbows, spell out words, and make shapes. I think the King would have been tempted to stay in this bathtub for a long, long time! Oh and cleanup is even fun. Tons of bubbles from all that shampoo! 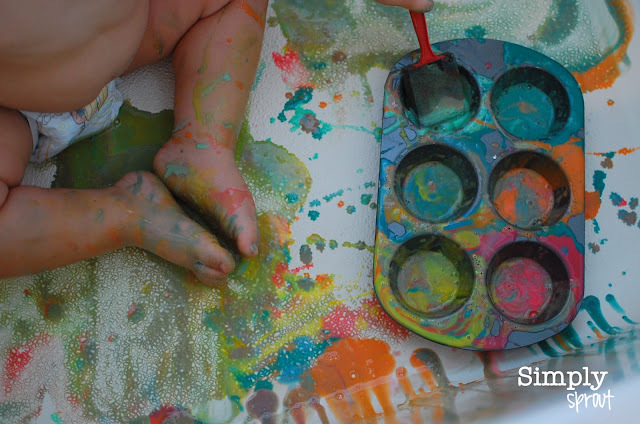 We would love to hear about what silly things your kids have done in the bathtub for fun. Leave us a comment and share a fun and creative idea with us. We will randomly select a king or queen of the comments to receive their own copy of King Bidgood's in the Bathtub at the end of the week! You could always mix cornstarch, Cool Whip, and food coloring! That way at least it's edible! My kids got Crayola bath tabs in their stockings for Christmas. They each have a plastic toy tea cup and I sing in my best British accent while I plop one color tab in each cup. Then they dump their cups in he water and we wait to see what color we will mix up. Good lesson in art and learning what colors make up other colors and they love my silly British accent! 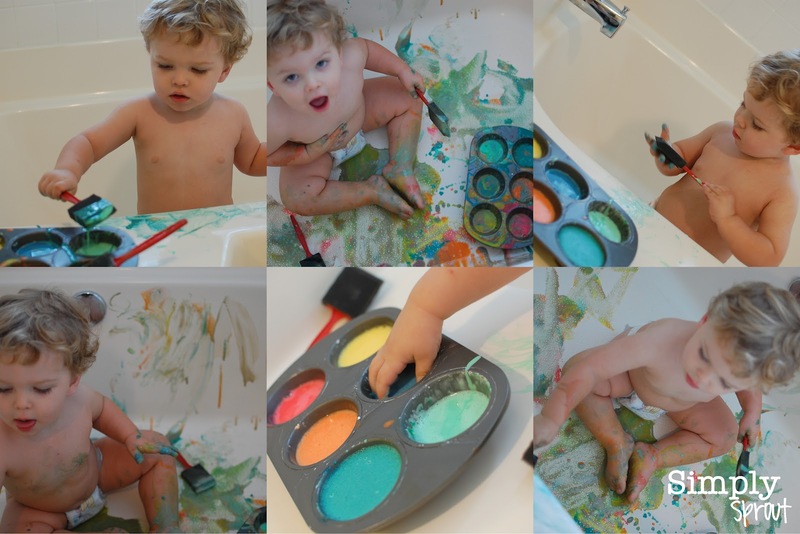 Our favorite bath time fun has definitely been paint....Usually paint is never left over! What a fun giveaway and book! Rylee loves playing with crayons in the bathtub...this is an awesome way to have fun! There are days where I think I'll never get her out, and she always wants to clean the bathtub with her soap while she is in there...this will be a nice treat, and then I can let her "wash" the bathtub like she always tries to do...fun!!! !